Less Frequent Mailer? Try a shot of SA5! If you mail less frequently and don't want to commit to an annual subscription of mailing software, then we offer a single update version of our all-in-one address correction and presorting software, SmartAddresser 5. 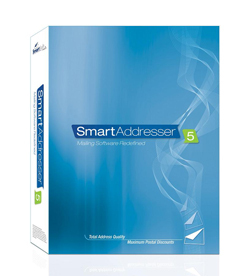 You'll enjoy all the benefits of our powerful CASS Certified address correction engine, as well as all the PAVE certified presorting features of the full subscription version of SmartAddresser 5, for a limited time. It's a great way to try SmartAddresser 5 without the annual commitment. Plus, if you decide to upgrade to the full annual subscription of SmartAddresser 5 within 30 days of purchase of the SmartAddresser 5 Shot, we'll discount the purchase price of $595 from your annual subscription!